Analog Man carries the Voodoo Labs Pedal Power 2 Plus power supply. Sorry we can not sell any foreign versions, only the 120V AC USA version of the PP2. Size is about 6.25" x 3.5" x 2" tall. Now in stock - Pedal Power 2 PLUS! available in Summer of 2005, Outputs 5 and 6 now provide up to 200mA each on the NORMAL (9V) setting. Use these outputs for high current pedals like the Boss DD-20, EH holy grail, etc. Use any output on the NORMAL setting for line6 compact pedals. Only the larger MODELING pedals require outputs 5 or 6 on the L6 setting. The outputs 5 and 6 are regulated to 9V in the normal setting. Any current draw from 0 to 200mA will give you a nice 9V output. regulation, it puts out 16V unregulated. in a fairly linear manner from 16Vdc at no load to 11V at 250mA. This also depends on the wall voltage the PP2+ is plugged into. 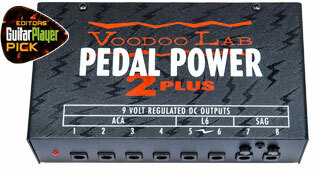 The Voodoo Lab Pedal Power 2 is a universal power supply for all battery-operated guitar pedal effects. New features include two outputs that will power Line 6 modeling pedals and two outputs that can have a variable voltage "sag" to emulate dying carbon batteries. NOTE : The LINE 6 output is not REALLY an AC output, the line 6 pedals will work on DC too. But the LINE 6 output will not power pedals like the Captain Coconut-2 which demand true AC power. On the 2005 PP2+, the outputs 5 and 6 will have 200mA of current available, to run the Boss Twin pedals, when in normal 9V setting. All 8 outputs are set from the factory for normal 9V Boss style output. They change when you switch the associated DIP switch underneath. Like the original Pedal Power, each of its eight outputs are completely isolated, short circuit protected, regulated and highly filtered. The Pedal Power 2 comes complete with cables, detachable AC power cord, is hand made in the U.S.A. and carries a 5-year warranty. Each output is completely isolated. This means that you won't have any ground loops or interaction between pedals that can cause hum and noise. It also means that unlike other "common ground" power supplies, you can run effects that have both negative and positive grounds without difficulty. There are two types of Boss pedal effects, which specify either PSA or ACA type power supplies. Boss pedals specifying the PSA type adapter operate at 9V like most other pedals. Boss pedals which specify the ACA type adapter operate at a higher voltage. See our FAQ for more info on the boss adaptors. The Voodoo Lab Pedal Power is the only universal power supply available which will power any type of Boss pedal effect. There is a selector switch for each DC output on the bottom of the Pedal Power to select the correct voltage. Only the first 4 outputs can be set to ACA voltage, however. NOTE that the ACA output (12.2V DC) can also be used to give a bit more voltage to certain pedals which can utilize it. For example, our TS9/808/Silver mods and Clone Chorus really enjoy the extra voltage and you may prefer the tone when powered in the ACA mode. Each output on the Pedal Power is short-circuit protected. This means that if you have a short in a power cable, or one of your pedals malfunctions, the Pedal Power will temporarily turn off the power to that pedal. All other outputs will continue to function normally and the Pedal Power is not damaged. Power transformers create an electric field that can cause hum and noise in your effects. Some effects, such as wahs, are particularly susceptible to this. A toroidal transformer has a specially designed core that greatly reduces this electric field. The Pedal Power uses this type of power transformer so that your pedal board is quiet. 120V 60Hz or 50Hz (plus model only). We only sell this US version, sorry we can not get the overseas versions. Outputs: Eight 5.5x2.1mm barrel connectors, center negative. Cables are about 20 inches long. I have some extras of of the above standard cables available, plus a reverse polarity cable, for $3.50 each. Also have a Y-Cable to convert two PP2 outputs to 18V, for $15. Please email me if you would like to add these to your order. Sorry we can't take orders for JUST CABLES, if you just need extra cables please order direct from voodoo labs.